One of my lovely scrapbooking friends is getting married this month and to celebrate Mum and I travelled to Uralla on Sunday for a little scrapbooking shower with friends. It was a lovely day and even though I did absolutely no scrapbooking it was fabulous to catch up. 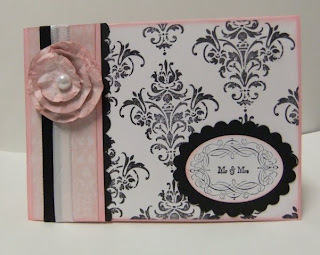 I was still in a pink, black and white mood after this layout (and it won the Stamp-A-Memory Challenge..I was very excited lol). Anyway back to the card, I have used Sale-a-bration set "Vintage Labels" together with the Mr & Mrs from "Occasional Greetings" and the damask stamp from "Friends 24-7". The large black scallop oval is actually a diecut I "borrowed" from my Mum's stash but it fitted the wide oval punch so perfectly...obviously it was meant to be. 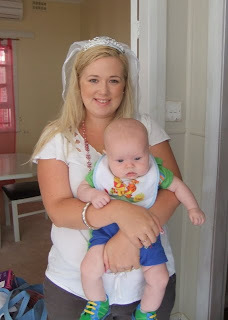 Here is Dannii and her gorgeous bub Cooper. Aren't the veil and bling divine. Danni sure knows how to dress for the occasion. Wishing you all the best for a fabulous wedding day Dannii and a lifetime of love and laughter with your man and your gorgeous little bub. 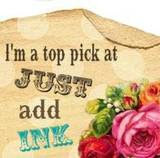 Can't wait for another Scrapbooking day otherwise I will be waiting to see all the girls in August at this fabulous event. I was checking the SPCC blog this morning for the new colour challenge and noticed that my soccer layout made the Top 5. I thought that was prety cool. Love those cute photos of Ben playing soccer. Thanks for visiting and thanks to everyone who has left comments for me. I absolutely love reading them and it has really made my week.